Taste your way through fall with these Spiced Apple Parfaits! They’re healthy and work perfectly as breakfast, or even a light dessert! Taste your way through fall with these Spiced Apple Parfait’s! They’re healthy, and work perfectly as breakfast, or even a light dessert! They come together quickly and require only 10 minutes of cooking. You start with 1/2 cup of your favorite vanilla flavored greek yogurt (I tend to buy Chobani or Fage). Then, you add 1/4 cup granola of your choice (I’m in love with Nature’s Path Organic Pumpkin Flax Plus Granola from Costco, at the moment) and top it with warm spiced apples! It’s healthy and filling enough to be eaten as breakfast, but comes across as indulgent enough to be eaten as dessert. Talk about a win! Have you ever sautéed apples before? I hadn’t and it’s beyond simple. There’s a handful of recipes out there that call for lots of butter and brown sugar when sautéing apples. I was trying to keep it healthy so that I could eat the apples guilt-free for breakfast, so I came up with a simplified way to sauté the apples. I started with just a single tablespoon of butter (compared to 4+ tablespoons in the recipes I was viewing) and melted it in a large non-stick skillet. Then, I added 4 chopped Honey Crisp Apples (use any apples you like) to the pan. When the apples were about halfway done, I sprinkled about a 1/2 teaspoon of ground cinnamon over the apples, then sprinkled a little Truvia (in place of sugar- but feel free to use real sugar) over the apples and continued cooking them until they were fork tender. Not mushy, just tender. What this isn’t: These spiced apple parfait’s are not overly sweet. If you’re expecting lots of sweetness, this isn’t for you. What this is: These spiced apple parfaits are healthy, wholesome, and downright delicious. The flavors of fall just ooze out of these parfaits and I LOVE it! All this talk of apples has me craving apple cider, or applesauce or totally unrelated…a good game of Apples to Apples! Love it all! P.S. : I purposely left the skins on the apples because of the all the nutrients they contain. Melt 1 tablespoon butter over medium-high heat in a large non-stick skillet. Toss the diced apples with the juice from one lemon. When the butter has melted, add diced apples. Saute’ for about 5 minutes. Sprinkle 1/2 teaspoon cinnamon and 2 teaspoons Truvia or sugar over the apples. Continue cooking for another 5 minutes, for a total of 10 minutes, or until the apples are fork tender. Make sure you don’t overcook the apples, otherwise they’ll be mushy. To assemble the parfaits, scoop 1/2 cup vanilla greek yogurt in a small dish. 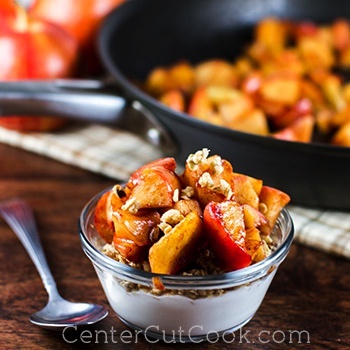 Top with 1/4 cup granola, and 1/4-1/2 cup sautéed spiced apples.